vinegar as it is more effective and leaves NO odor. 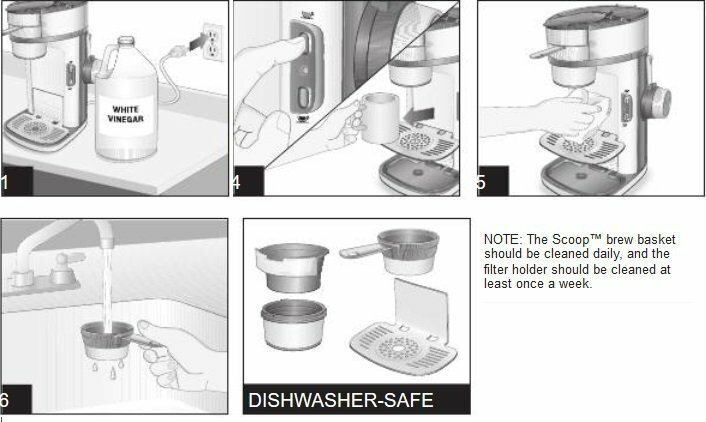 Follow package directions on coffeemaker cleaner. Dispense several cups before discarding solution. Clean BrewStation at least once a month (once a week for areas with hard water). Pour 1 pint (2 cups/500 ml) vinegar into water reservior. Press ON. Turn OFF after 20 seconds and wait 30 minutes. Press ON. Turn OFF when finished. When cool, dispense several cups before emptying and rinsing reservoir. Run 2-3 more brew cycles with CLEAN WATER only. Allow to cool between cycles. Electrical Shock Hazard. Do not immerse the base or tank in water. Periodically clean appliance with water and white vinegar solution. Remove stem assembly, basket, and lid. The metal urn parts will be hot. Use a pot holder or oven mitt to remove the lid. Clean inside of appliance with warm, soapy water. NOTICE: To avoid damage to the urn, do not use abrasive cleaners or pads on any part of the coffee urn. Unscrew coffee tank seal/filter assembly from inside tank. Wash in warm, soapy water. Replace assembly. Tighten to avoid leaking coffee. To ensure proper operation, periodically scrub the heat well located at the bottom of the urn. DO NOT use the “SANI” setting when washing in the dishwasher. “SANI” cycle temperatures could damage your product. 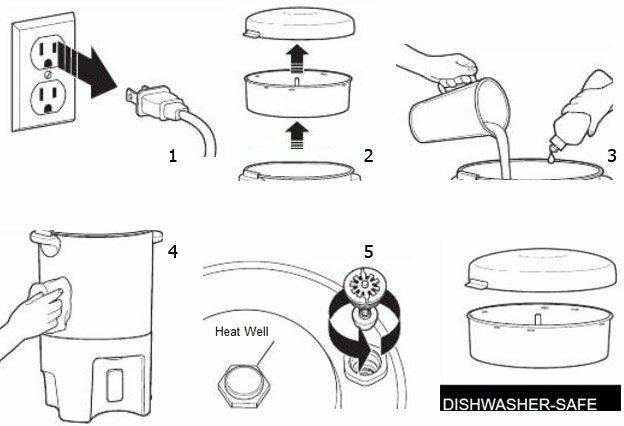 Clean urn every 15 to 20 cycles to remove mineral deposits and buildup, or more frequently if using hard water. Remove basket and lid. Pour equal parts water and white vinegar into urn. Plug in and let percolate one cycle. After one cycle, let sit 15 minutes. For best results, drain liquid from urn using coffee dispensing bar. This will clean both the urn and the tank/seal filter assembly. Remove assembly as shown in Step 4 and clean this area with paper towel. Once urn is completely cool, follow steps in “How to Clean” section. Add water to 40-cup fill line. Replace stem assembly and coffee basket. Add 2 Tablespoons (30 ml) cream of tartar. Replace lid. Plug in and let percolate one cycle. After one cycle, unplug and let sit 15 minutes. Drain liquid from urn. Let cool; then clean. See “How to Clean” section. All appliances should be cleaned at least once a month (once a week for areas with hard water). 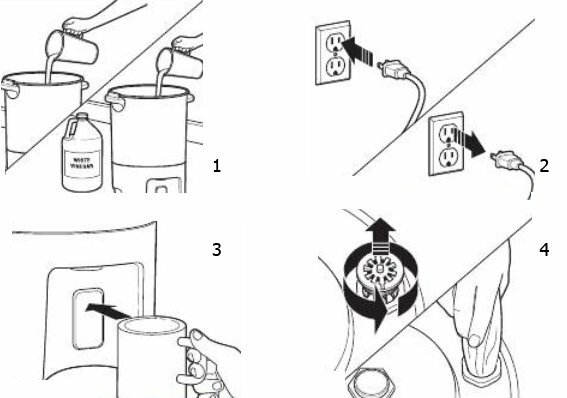 Do not immerse cord, plug, or coffeemaker in any liquid. needle on underside of lid also is sharp. Use caution when handling. Pour 3/4 cup (177 ml) of plain white vinegar and 3/4 cup (177 ml) of cold water into reservoir. Place a 14-oz. (414 ml) cup or travel mug underneath to catch the water/vinegar solution. Press the REGULAR or BOLD button once. After 30 seconds, unplug unit and allow vinegar to clean. After 30 minutes, plug in unit. Press REGULAR button and allow it to finish the brew cycle. When brew cycle is finished, wait for unit to cool. Empty cup and rinse. Run 2 to 3 cycles of cold tap water. The unit is cleaned and ready to make drinks. 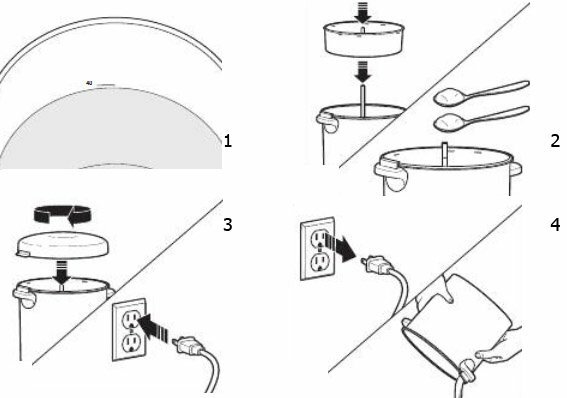 Routine Cleaning of the Needle: The needle is located in the lid of the coffeemaker. Bend a small paper clip as shown; insert the tip of the paper clip through the hole/eye of the needle and up into the needle to ensure grounds have been removed. Brew 2 or 3 times with cold water to make sure grounds have been removed from the piercing needle. Press the ‘cup’ button once. 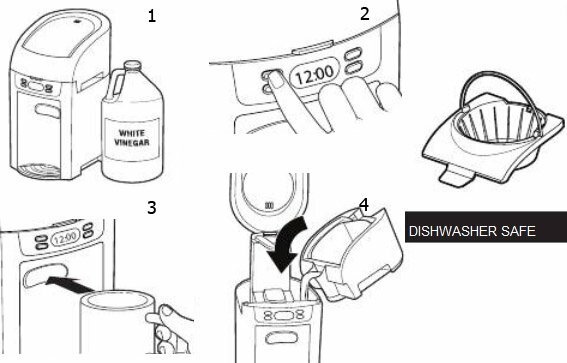 After 30 seconds, turn unit OFF (O) using the ‘cup’ button and allow vinegar to clean. After 30 minutes, plug in unit and allow it to finish the brew cycle. When brew cycle is finished, wait for unit to cool. Replace accessories. Run two to three cycles of cold tap water. The unit is now cleaned and ready to make coffee. Discard grounds after each use. Rinse and/or clean with soapy water. Towel dry or hang dry on brew basket holder. Hamilton Beach coffee makers are fit with sensors and indicators, which serve for notification of householders. Our Hamilton Beach troubleshooting desk can help you to know these notifications.